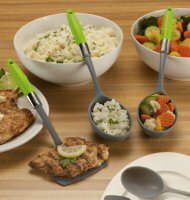 Healthy Steps is a company that makes kitchen tools that focus on portion control. As a nutritionist, I love this! It is hard to tell what a portion size is unless you measure it out and these tools make it easy. Many people are extremely confused what a portion size is and there are many healthy steps products that can help you save calories and prevent weight gain by helping you control your portion size. Here is some information about the company: Healthy Steps™, helps consumers eat healthier by providing tools that assist in portion control without the hassle of weighing foods or counting calories while encouraging the consumption of healthy recipes. For my review, I was sent the water infuser which helps to infuse water with different flavors such as cucumbers, melon, lemon, etc. this is great if you do not like the taste of regular water. I was also sent the serving set which includes a serving spoon for starches, pasta, and a spatula for your protein. I think that this tool is the most important for starches because people often struggle with how much they should eat. I think that you should eat at least the amount of vegetables on the spoon and more if you want. Vegetables are great for you. The tools seem to be good quality and I have enjoyed using them. I think these tools are great! Great Tool ! I like ! I think these are wonderful ideas! There is a restaurant near where I work that serves flavored water--cucumber and mint or pineapple and ginger. I love it. I can drink water there by the gallon (okay a little of an exaggeration but really it is good)! My favorite product is the pasta one - why can't I think of the name? It's amazing, and has given me the confidence to cook pasta again because I know I won't go overboard!